evening in tuscany, originally uploaded by jahansell. The annual fundraiser for Sharon's all-volunteer Fire Department is not to be missed. 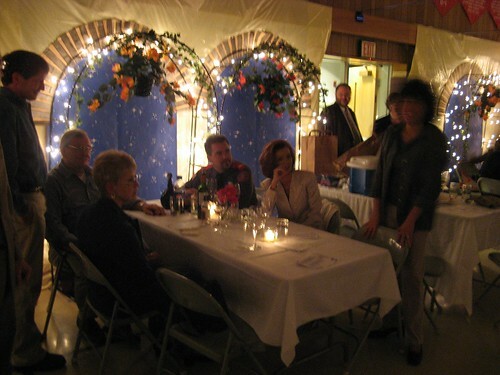 Last night the talented committee turned the school into a Tuscan villa and it was spectacular. Everyone in Sharon goes, and they dress for it like it's a once-in-a-lifetime spectacular. I meant to take more photos - of the gowns, the decor, the band, and of course the Fireman's Parade, which is always the highlight of the event. But I found myself at a table with so many good friends that we didn't want to stop eating and laughing - we sat there for at least an hour after everyone else had gone up for the parade and dancing. By 9:30 I turned into a pumpkin - had to pick up the kids and get them to bed. So we missed the great band and the entertainment provided by the crowd itself - rumor has it a brawl broke out a few years ago. I couldn't say whether it's true, and as far as I know last night was perfectly decorous. Just a handful of additional photos here.